Playing what might have been the world's most tedious game of Where's Waldo?, scientists used photos taken from space to count all the emperor penguins in Antarctica. They found more than a hundred thousand birds that hadn't been spotted before. The news may affect the penguins' fate in a warming world. Besides, what's a better surprise than extra penguins? Researchers from several institutions, including the British Antarctic Survey in Cambridge, undertook the emperor penguin space census. They thought previous penguin counts might not be accurate. For one thing, the last estimate of the Antarctic penguin population is almost 20 years old. For another, humans can't easily travel very far from their Antarctic research bases to seek out half-frozen bird huddles. So penguin colonies that are farther out in no man's land might have never been spotted by people. 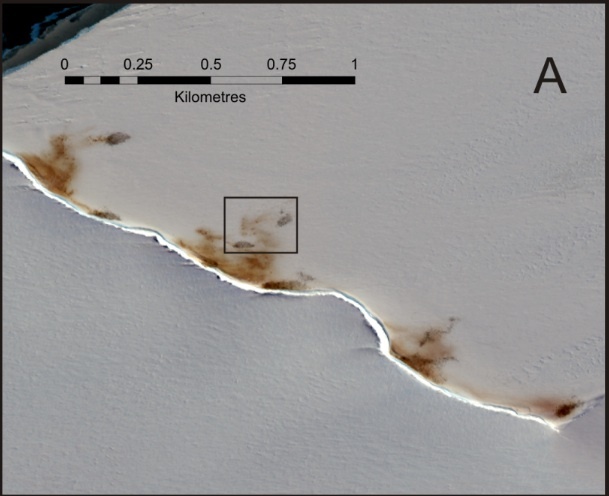 Thanks to emperor penguins' habit of clumping together in giant colonies during breeding season--and their convenient lack of camouflage against the snow--the researchers knew high-resolution satellite photos should reveal the penguins. They used images from all around Antarctica's coastline, where penguin colonies camp out. Forty-six colonies appeared, including several that hadn't been counted before. A penguin colony on the Antarctic coastline, spotted from above. After zooming in on each colony and sharpening the images, the researchers used computers to count the penguins one by one. The challenge was for the computer to decide which dark pixels represent penguins, rather than shadows on the snow--or penguin poop. 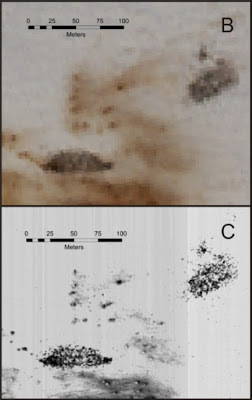 Author Peter Fretwell explains that in this method, "you 'train' the computer to recognize the pixels that are penguin, guano, snow or shadow by giving it sample pixels. The computer then goes away and splits the whole image into each pixel type." Zooming in on a penguin colony and sharpening the image. I think I found the guano. As long as the images have a high enough quality, Fretwell says, this technique is "usually quite accurate." Where the satellite pictures were more shadowy, penguin counts would be a little less certain. 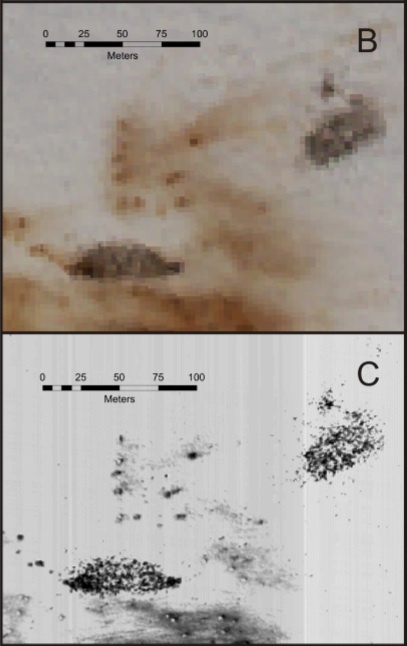 For some of the colonies, though, researchers were able to check their numbers against estimates others had made from the ground or from aerial photography. And then there were the missing penguins. All the satellite images were taken during the breeding season, when emperor penguins congregate to create adorable new baby penguins. The new parents take turns babysitting: While one penguin takes care of the chick, the other goes out to sea and swallows lots of fish to regurgitate later. While the chicks are small, they spend most of their time balancing on top of their parents' feet to keep warm. Once the chicks are old enough to walk around on their own, both parents may leave to forage. So for every individual counted in a satellite photo, the authors assumed there was a hidden chick and a second adult at sea hunting for food. (They were only interested in counting breeding adults, not the chicks, most of which will die.) Later in the season, some of the penguin pixels may have been kids instead of adults. But since a young penguin standing on the ice probably has two parents away foraging, the researchers figured that pixel still stood for two adult penguins. 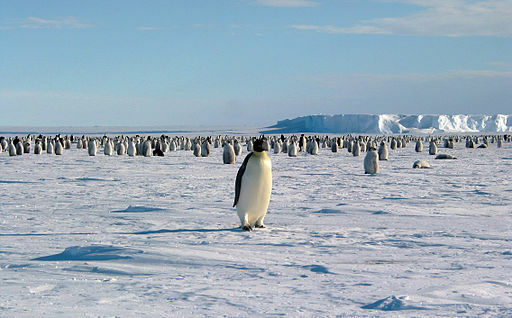 The final count was about 595,000 adult emperor penguins in all of Antarctica. That's roughly the (human) population of Milwaukee. It's also substantially higher than the last estimate, which put the population between 270,000 and 350,000 adult birds. The census could easily have overestimated or underestimated the true number of penguins. But, Peter Fretwell says, "The main thing is that this gives us an initial benchmark from which we can monitor emperor penguin numbers in the long term." As climate change tightens its grip on every part of the globe--all the way to the poles--penguins will certainly see some changes around them. The sea ice along the coastlines they inhabit will disappear; shifting food webs may make their prey scarcer; and severe storms might become more frequent. Knowing how many emperor penguins are there now, and where to find their colonies, will help scientists monitor how the species is coping with the changes. We might even be able to keep them from becoming harder to find than Waldo. Image: Close-up penguins from Hannes Grobe/AWI/Wikimedia Commons; satellite images from Fretwell et al. Note for British readers: You may know Waldo as Wally.